No one likes to fail. Sometimes, failure can be downright painful – even devastating. Even so, as much as we human beings might try to hedge things to prevent failure, we must never eliminate it. “We have to have failure to teach us to abandon foolishness.” I state this essential soundbite in my speech, The Anti-Socialist. In the speech, I use an illustration of a fictional story of my playing a one-on-one basketball game with the legendary Michael Jordan. No doubt, in such a game, that basketball superstar would proverbially “wipe the floor” with me. The ending score would likely be 500-0. The lesson of the illustration is that I, as a non-athlete, need that failure to teach me to not think that I am any kind of “equal” with Michael Jordan’s basketball skills. It teaches me to abandon that foolishness so that I would instead go do something else at which I am good. This is a fundamental lesson for all of humanity. Failure can teach us when we simply must stop wasting our time and effort trying something and to instead go do something else. It teaches us to re-direct our energy toward endeavors at which we can achieve excellence. But socialism is a proverbial “backstop” that prevents the education from failure. More directly put, socialism is a foolishness-continuer – which is why socialism always leads to mediocrity. As it seeks to equalize outcomes, socialism utterly bounces the failure back as if it was a success. When everyone is “equal” in outcomes, people with lesser, mediocre, or no skills are deceptively misled into wrongly thinking that they are good enough to continue. Without that failure, there is no teacher to abandon foolishness so as to go do something else. Absolutely, humanity fundamentally needs failure. That is why I am an Anti-Socialist. As part of the larger project to provide tools of shareable memes to polygamy supporters, the pic for this sound-bite has been posted on Pinterest. 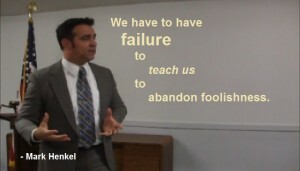 Pinterest PIC: We have to have failure to teach us to abandon foolishness. The video for the entire speech is posted online. It has also been embedded here below. These three links (one to Youtube and two to Pinterest) are provided as tools for activists to use when working to persuade and encourage others to allow freedom for polygamists. If you consider yourself a UCAP polygamy activist, the movement needs your help here. Please follow/comment/share these three items on social media.